Open packaging box, remove ThOR LT and check the contents. Make sure that nothing is missing. Inspect the device for damage to optical surfaces, body, eyecups, operation buttons, etc. Ensure that all optical surfaces are clean and ready for use. If any accessories are missing or broken contact ATN’s Customer Service at 1.800.910.2862. The device is equipped with a USB (type C) port for charging. You will find it under the rubber cap on the right side of the device. We have included a USB (type C) charging cable with your scope. Plug the cable into a USB wall charger that has an output of 2 amps (Wall Charger not included). Charge your scope for 6 hrs using a 2A USB wall charger. Note using a wall charger with lower amperage will take longer to charge your scope. Recommended charger is 2A USB charger. Battery charging time (from 0 to 100%) is 6 hours with 2 A USB charger. Battery run time is 10 hours on a single charge. To Turn On the device press and hold the Power button until you see the ATN Homescreen. To Turn Off the device press and hold the Power button. If the scope freezes or stops responding to the control panel. Press and hold the Power button for 15 seconds to reboot the scope. Short and Quick Taps — used for most functions and to navigate the menu. Press and Hold — designed to be used in the following situations — On/Off, Menu. By rotating the Diopter Adjustment Ring you will achieve optimal sharpness for your vision. Look through the eyepiece, focusing on the reticle and widgets on the screen. Rotate the diopter adjustment until the reticle and widgets are perfectly sharp in appearance. Once the Diopter Adjustment is set to your liking, adjustment will not need to be performed unless another user altered the focus for their needs. Rotate the Adjustment Ring, as necessary, to achieve the proper focus at various distances. Make sure your weapon is not loaded. Use safe weapon handling procedures at all times. 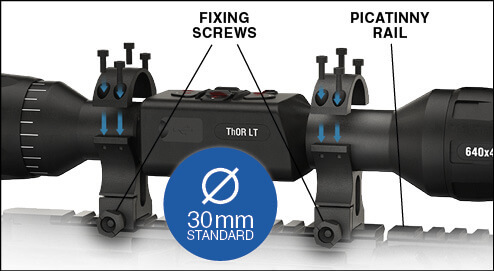 The ThOR LT has a 3-inch eye relief, and can be mounted using 30 mm mounting rings (not included). Place the scope on the bottom half of the rings you just mounted to the weapon’s rail, verifying you have sufficient eye relief for your platform. Place the top portion of your ring over the mounted bottom portion, make sure the holes align and the screws turn easily. Apply equal torque to all screws. Make sure your rings are tight on your rifles rail and will not come loose due to recoil. 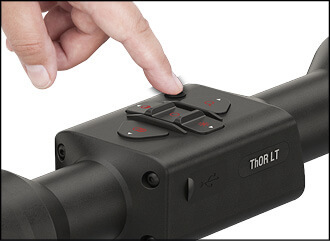 On/Off button; A long press of this button (1–2 seconds) will either power on the unit or power off the unit, depending on the current status of the scope. Up button; A short press of this button will cycle you through your change in zoom (3–6x or 4–8x). 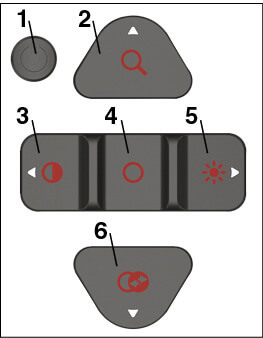 Left button; A short press will allow you to preform a contrast image cycle change (1 → 2 → 3 → 1). OK button; A short press of this button will perform a manual NUC. A long press (1-2 seconds ) will open the Menu. Right button; A short press allows you to adjust the brightness of your micro display screen (100% → 60% → 30% → 10%). 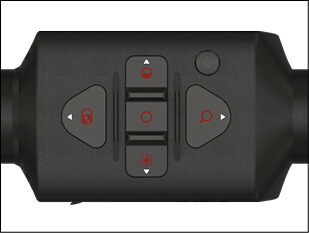 Down button; A short press will change your thermal mode from White Hot to Black Hot. The first screen you’ll see after turning on the device is the Homescreen. It consists of Scales, Status Bar icons and different Information Widgets. Roll Scale shows the rifles cant based on internal 3D Gyroscope. Pitch Scale shows rifle inclination based on internal 3D Gyroscope. NUC. This feature allows you to turn On/Off the auto NUC feature. PIX. This feature is intended to correct neutral pixels in the display. Select the option by using the OK button when PIX is highlighted. Move the dot to the area of the display with the neutral pixel, and place the flashing dot directly over the neutral pixel. A short press of the OK button will select that pixel for repair. After the short press of the OK button to select the pixel for repair, a long press of the OK button will exit the pixel correction mode. RET. This option allows you to select one of four reticles available in the scope. SENS. 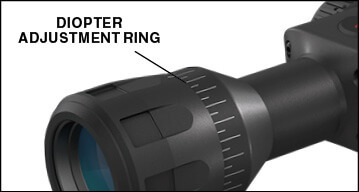 This option gives you the ability to adjust the thermal sensitivity of your scope. ZERO. This options gives you access to the One Shot Zero, in order to Zero your reticle to your weapon. 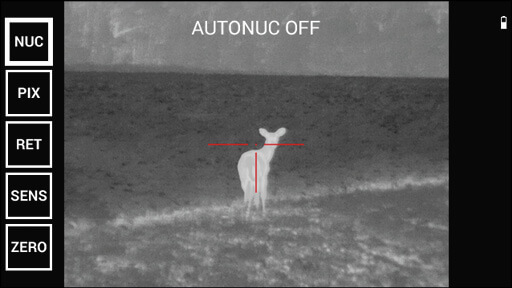 You will need to obtain a target that is able to be detected by a thermal imager. ATN has thermal targets available for purchase, or you can use any of the following items: Cold or Hot water bottle, hand warmers, or foil based tape. We recommend using a boresight device in order to get on target faster. Once the scope is aligned with a boresight, follow the One Shot Zero procedure in order to Zero the scope to your weapon. To Zero your scope you will need to go to the Zero section of the Menu. Press and hold the OK button until the menu appears in the sidebar of the display. Use the Down button to navigate to the Zero option in the menu. Press the OK button to enter zero mode. You will see on your display two reticles. One will move via use of your keypad, the other will remain stationary. While keeping the gun as steady as possible, fire a round. Using the key pad, move the red reticle to the point of impact while keeping the black reticle on the original point of aim at which you fired the shot. Once you have placed the center of the red reticle on the POI, short press the OK button to save the zero. If you feel confident that you have the best possible zero, a long press of the OK button will exit the menu and return to the Homescreen. If you need to fine tune the zero you can refer to the previous instructions to fine tune the zero. Although you may not need more than one shot to Zero your scope, we do recommend that you fire additional shots once the initial zero process is complete to insure the optic and weapon are truly Zeroed. If additional corrections need to be made to fine tune the zero, then make those corrections as needed. NUC’ing helps to improve the image quality when the image is degraded by various environmental factors. There are multiple NUC tables that span the full operating temperature range, and the scope automatically selects the optimum table based on its temperature. You can set the system to perform a NUC automatically at a predefined time interval. Or, you can turn the automatic NUC off and NUC the system manually, when required. Also, you can use the NUC shortcut from the Homescreen by quickly pressing the OK button anytime. Example: Change of temperature, continuous viewing of a particular warm object, and movement from one environment to another all may cause image degradation. In order to turn the automatic NUC On or Off. Press and hold the OK button for the menu to display. Using your Down Arrow button, scroll to NUC. Press the OK button to enter the NUC menu. Press the Up button to cycle the NUC On or Off. Press and hold the OK button to exit the Menu. You can also manually NUC the scope from the Homescreen by quickly pressing the OK button. You can select the reticle style in the System Menu. To enter the System Menu, open the Menu by pressing and holding the OK button, use the Down Arrow button to select RET. Press the OK button to enter the Reticle Menu. Once there, use the Up and Down Arrow buttons to select the reticle you like. Press the OK button to save your selection. To Exit the Menu, press and hold the OK button. CONTRAST — the difference in luminance and color that makes an object more distinguishable. You can change the contrast by quickly pressing the Left Arrow button to cycle through the preset contrast settings. THERMAL SENSITIVITY — Allows you to select how sensitive the Thermal Sensor is in picking up thermal heat signatures. In order to change the Thermal Sensitivity, press and hold the OK button. When the Menu appears, use the Down Arrow to select SENS. Press the OK button to enter the Thermal Sensitivity Menu. Press the Up button to cycle through the sensitivity options. Once you select the Thermal Sensitivity you would like to use, short press the OK button to save your selection. Press and hold the OK button to exit the Menu. Always remember to turn off the device when it is not in use. Do not disassemble, drop, open, crush, bend, deform, puncture, shred, microwave, incinerate, paint or insert foreign objects: it will void your warranty. Keep the scope in the provided protective cover when not in use. Avoid contact with dust, steam, and gas. The scope is a precision electro-optical instrument and must be handled carefully. Do not scratch the external lens surfaces or touch them with your fingers. Failure to follow these safety instructions could result in damage to the device! This product is guaranteed to be free from manufacturing defects in material and workmanship under normal use for a period of 3 (three) years from the date of purchase. In the event a defect that is covered by the foregoing warranty occurs during the applicable period stated above, ATN, at its option, will either repair or replace the product, and such action on the part of ATN shall be the full extent of ATN’s liability, and the Customer’s sole and exclusive remedy. This warranty does not cover a product (a) used in other than its normal and customary manner; (b) subjected to misuse; (c) subjected to alterations, modifications or repairs by the Customer or by any party other than ATN without prior written consent of ATN; (d) special order or “close-out” merchandise or merchandise sold “as-is” by either ATN or the ATN dealer; or (e) merchandise that has been discontinued by the manufacturer and either parts or replacement units are not available due to reasons beyond the control of ATN. ATN shall not be responsible for any defects or damage that in ATN’s opinion is a result from the mishandling, abuse, misuse, improper storage or improper operation, including use in conjunction with equipment which is electrically or mechanically incompatible with or of inferior quality to the product, as well as failure to maintain the environmental conditions specified by the manufacturer. This warranty is extended only to the original purchaser. Any breach of this warranty shall be waived unless the customer notifies ATN at the address noted below within the applicable warranty period. The customer understands and agrees that except for the foregoing warranty, no other warranties written or oral, statutory, expressed or implied, including any implied warranty of merchantability or fitness for a particular purpose, shall apply to the product. All such implied warranties are hereby and expressly disclaimed. ATN will not be liable for any claims, actions, suits, proceedings, costs, expenses, damages or liabilities arising out of the use of this product. Operation and use of the product are the sole responsibility of the Customer. ATN’s sole undertaking is limited to providing the products and services outlined herein in accordance with the terms and conditions of this Agreement. The provision of products sold and services performed by ATN to the Customer shall not be interpreted, construed, or regarded, either expressly or implied, as being for the benefit of or creating any obligation toward any third party of legal entity outside ATN and the Customer; ATN’s obligations under this Agreement extend solely to the Customer. ATN’s liability hereunder for damages, regardless of the form or action, shall not exceed the fees or other charges paid to ATN by the customer or customer’s dealer. ATN shall not, in any event, be liable for special, indirect, incidental, or consequential damages, including, but not limited to, lost income, lost revenue, or lost profit, whether such damages were foreseeable or not at the time of purchase, and whether or not such damages arise out of a breach of warranty, a breach of agreement, negligence, strict liability or any other theory of liability. In order to validate the warranty on your product, ATN must receive a completed Product Warranty Registration Card for each unit or complete warranty registration on our website at www.atncorp.com. Please complete the included form and immediately mail it to our Service Center: ATN Corporation, 1341 San Mateo Avenue, South San Francisco, CA 94080. Copyright © 2000 — 2019 ATN Corporation. All rights reserved.